Daumier was partial to the theme of travel and public transportation; he executed his first lithograph of an omnibus in 1839. While his prints often focused on the comedic aspects of modern travel, such as overcrowding and the awkward interaction of the classes and the sexes, his paintings were more contemplative and dignified. 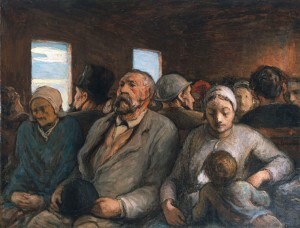 Third-Class Carriage solemnly captures the plight of the lower classes, as Daumier presents a cross section of Parisian society, juxtaposing youth and old age, men and women, all of whom crowd together in the narrow railway car, which represented modernity in its day. Despite the work’s small size, Daumier’s figures maintain a strong physical presence, enhanced by the artist’s expressive brushwork and bold, sculptural modeling. With downturned eyes, solemn facial expressions, and hands folded as if in prayer, Daumier conveys the heroism of his “third-class” subjects, a defining characteristic of French realist painting. When the work was competed in 1858, the railway was a powerful symbol of modernity and Daumier’s treatment of the subject illustrated his now-famous phrase, “il faut être de son temps” (“one must be of one’s time”). Bruce Laughton, Honoré Daumier (New Haven: Yale University Press, 1996), 109. “Art at Home and Abroad: History of Modern Art at the International Exhibition Illustrated by Paintings and Sculpture,” New York Times, 23 February 1913, 59. L. Merrick, “The Armory Show,” American Art News 11, no. 21 (March 1, 1913): 2. The French printmaker, caricaturist, painter, and sculptor Honoré Daumier first rose to prominence in Paris in the early 1830s, following the publication of his satiric and anti-monarchist lithographic cartoons in the left-wing journals La Caricature and Le Charivari. He was eventually imprisoned for his caricatures of King Louis-Phillipe and, upon the reinstatement of France’s censorship laws in 1835, he was forced to turn his attention from political caricature to social satire. Although best known for his graphic work, Daumier began regularly painting in oil and watercolor in 1848. However, the extent of his painted oeuvre was not publicly known until 1878, the year before he died, when close friends organized the first exhibition of his paintings at Galerie Durand-Ruel, Paris, to raise funds for the destitute artist. Included in this exhibition was Third-Class Carriage, a work that solemnly captures the plight of the lower classes and has become his best-known painting. At the Armory Show, Daumier’s work was displayed in Gallery P alongside the works of “old masters” including Francisco Goya, Eugène Delacroix, Camille Corot, and Gustave Courbet. By including a retrospective section, the exhibition’s organizers aimed to illustrate the continuity of modern art, drawing parallels between the art of the past and the innovations of the present. In this context, Daumier was viewed as a forerunner to more recent artistic developments such as Post-Impressionism. In 1913, Daumier also embodied the artist whose once-radical works were now widely accepted and critically revered, providing a precedent for the younger generation of avant-garde innovators. However, Daumier’s most radical and controversial works – his political lithographs – were not exhibited at the Armory Show. Instead, the artist was represented by two small-scale oil paintings and a pencil sketch, all of which were lent by American collectors, further underlining his trans-Atlantic popularity in the early twentieth century. See Bruce Laughton, Honoré Daumier (New Haven: Yale University Press, 1996).